Our fourth of July was pretty layed back. We met some of our friends and family (David's parents, Greg, Angie, Elijah and Meadow) at the family picnic that concluded the Lipscomb University lectureship. It was a nice, relaxing evening on the campus. The event was catered by several different vendors so David was able to get his bbq and I settled for the Chick-fil-A. We had a great time visiting with our friends and Asher kept us (mostly David) busy walking around everywhere his curious little eyes took him. Above is Asher playing with his friend Ethan. 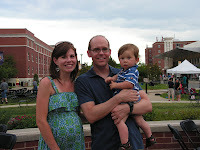 Family picture of us on the Lipscomb campus (hope you enjoy the view of me at 25 weeks!). After dinner, we headed home to put Asher to bed and then later that evening watched the downtown fireworks from our porch (another nice thing about living downtown). Sarah, love the blog. It looks great! We'll have fun checking in and reading about what's going on with all of you. Happy belated fourth. 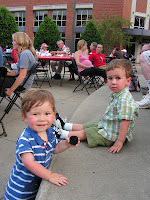 We enjoyed seeing you and Asher at the cousins picnic. Asher's one year pictures are beautiful.